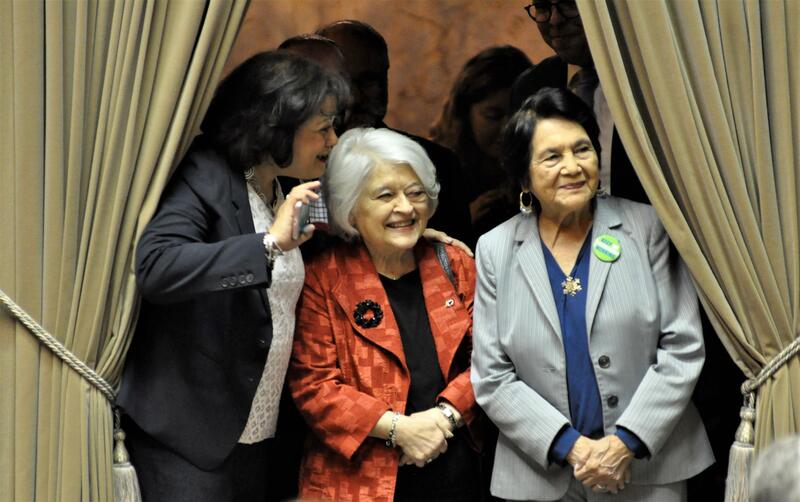 UPDATED: Mon., March 18, 2019, 6:55 p.m.
OLYMPIA – April 10 will be set aside to honor longtime civil rights activist and labor organizer Dolores Huerta under a bill that received final approval Monday in the state Senate. The co-founder of the National Farm Workers Association once told her people to never be ashamed to say they work in the fields, calling it “God’s work” that provides food for everyone’s table. With Huerta watching from the wings with other activists for Latino communities, the Senate sent to Gov. Jay Inslee on a unanimous vote a bill calling for state recognition for her on her birthday. While not a paid legal holiday, setting aside a special day is an honor reserved for special groups like Korean War veterans, Purple Heart recipients and former prisons of war and individuals that include Mother Joseph, Marcus Whitman and Cesar Chavez. Huerta helped co-found the National Farm Workers Association, organized workers and advocated for safer working conditions and health care benefits for them. After the Senate vote, she spoke to activists gathered on the North Steps of the Capitol for Latino Legislative Day, urging them in English and Spanish to make sure their communities are counted for the upcoming 2020 census so they are represented in government and eligible for federal and state programs. Published: March 18, 2019, 5:12 p.m. Updated: March 18, 2019, 6:55 p.m.